It’s common to listen to friends and family for advice on any number of things, even when it comes to your HVAC system. While there are many tips about system care and maintenance out there that are helpful, some of the advice might actually be a common myth. 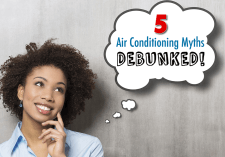 Here are five A/C myths we’d like to debunk! MYTH #1 - I'll save money on my A/C usage if I run fans throughout my home. Unfortunately, fans don’t actually cool the temperature of the air. You will feel the movement of the air, which will help you to be comfortable, but the temperature of your home won’t be effected with the extra usage of fans. If you operate fans in unused rooms, you are essentially wasting energy usage. Our Expert Advice: Keep the air conditioner on and fan usage limited to the rooms that are in most frequent use. MYTH #2 - A bigger air conditioner will result in better comfort. The size of your air conditioning unit should depend on many factors, including the size of your home, the layout and the quality and design of the ductwork. While bigger may seem 'better', an oversized system will likely short-cycle from frequent transitions between on and off modes, resulting in constant wear and tear or even a system breakdown. Our Expert Advice: When buying a new air conditioner, confirm that your contractor has properly sized the system for your specific home. MYTH #3 - I should turn my A/C off when I leave for long periods of time to save money. While you may have heard conflicting advice on whether or not to turn your A/C off while you are away for an extended period of time, most experts will tell you to keep the cooling system ON. The money you save will be minimal compared to the strain you will put on your system when it is turned back on to reach the desired temperature again. Our Expert Advice: Set the thermostat to a temperature that is only slightly less comfortable, yet still protects your plants, pets and furniture from dangerous humidity levels. If you have a programmable thermostat, you could schedule to resume normal cooling before you arrive home. MYTH #4 - If my air conditioner is working, I don’t need to get it serviced. Because air conditioners are complex systems, its best to have an HVAC professional provide seasonal maintenance and care. This can not only help to increase the efficiency of your system, but also prevent future breakdowns and problems with your system for years to come. Our Expert Advice: Get the 'best bang for your buck' and ask about our Annual Maintenace Plan, which includes 2 seasonal tune-ups, discounts on service and more! MYTH #5 - I should wait until my A/C breaks down before I consider replacing it. By preparing for replacement ahead of time, you will not experience an emergency situation of a breakdown in the heat of summer. In many cases, you are able to recoup the cost of a new air conditioner in a handful of years with the energy savings you receive with higher-efficiency system operation. Get better comfort and energy-friendly usage by being proactive about replacement. Call Logan Services of Columbus, Dayton or Cincinnati, Ohio today and ask about your heating and cooling options today! The home of fast, friendly service!